For a very complete bibliography see: Ouditt, Sharon (ed.) 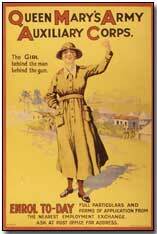 Women Writers of the First World War: An Annotated Bibliography (London: Routledge, 1999). Ouditt excludes poetry by women on the grounds that Catherine Reilly's (ed.) Scars upon My Heart: Women's Poetry and Verse of the First World War (London: Virago Press, 1981) covers the field very well, as it certainly does. Ouditt lists 160 'contemporary accounts' (books, articles), 21 official publications, 19 diaries, 15 volumes of letters, 61 autobiographies, journals, archive material, literary criticism, social and cultural history, and biographies. Most of the primary sources were published during the war or in its aftermath (up to 1939). See also the anthologies edited by Joyce Marlow, The Virago Book of Women and the Great War, 1914-18 (London: Virago, 1998) and by Angela K. Smith. (ed.) Women's Writing of the First World War: An Anthology (Manchester: M.U.P., 2000). Tylee, Claire (ed.) War Plays by Women: An International Anthology. London: Routledge, 1999. Tate, Trudi (ed.) Women, Men and the Great War: An Anthology of Stories. Manchester: M.U.P., 1995. Other women war poets: Edith Bagnold, Elizabeth Daryush, Mary Webb, Edith Sitwell, Eleanor Farjeon, Nancy Cunard, Louisa Prior, Marjorie Pratt, H.D., Eva Dobell, May Herschel-Clarke, Storm Jameson.